If you have, don’t worry, you are not the only one. Even native speakers will sometimes get things like this confused! When you learn English, it helps to know little grammar tricks that help you tell the difference between words like these. While ‘either’ has a positive connotation, ‘neither’ holds a negative significance. You will always find them paired up this way: either/or and neither/nor. These are the ways you can find them being used. For example, I don’t like spinach. – Neither do I. For example, The house has a door at either end. For example, Both these roads go to Rome; you can go either way. 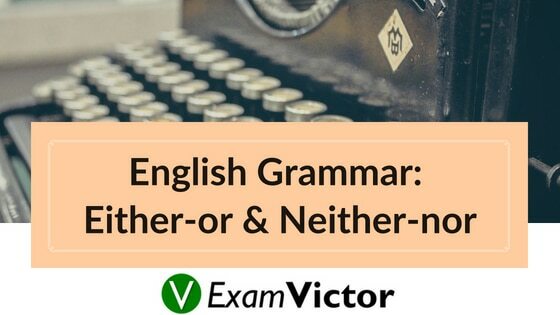 In all the cases in which we find “either” and “neither” as conjunctions, we also find them combined with “or” and “nor“. For example, You can either call me at home or at the office. neither/nor – When they’re paired up they negate both parts of a statement. For example, Neither the blue one nor the red is available in size 4. Also, share your views in the comment section below.